Builders Merchants are perfect choice for sourcing all your cladding, timber, fencing, flooring, sheets, decking and more. With a complete range of building products you can find everything you need under one roof. Smart Build Supplies, conveniently based on the Marsh Barton Industrial Estate, is the ideal place to source your building supplies. In an accessible location, with a range of standard, bespoke and innovative products they can supply practical solutions for your building needs. Building using renewable resources is becoming increasingly popular every day. People are beginning to realise a beautiful building can be created not just by using new building supplies, but also by sourcing their products from sustainable resources such as local forests, recycling rubbish and other locally sourced goods. 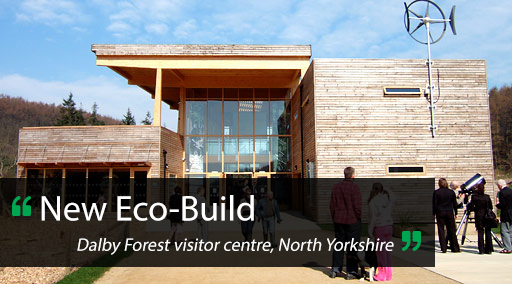 A good example of a new eco-friendly build is the Dalby Forest Visitor Centre, North Yorkshire. This new building recycled yogurt pots, old wellington boots and mobile phones to create the reception desk. Old tyres and inner tubes were used to create the roof cover and everything in the building can be recycle when its reached the end of its purpose.